The RackiT™ Bike Rack is a unique solution for storing and securing bikes. The creative and modern design makes it easy to load and remove bikes. Particularly good for small and narrow spaces. This outdoor bike rack is virtually maintenance free made with durable, weather resistant, silver powder-coated galvanized steel. Mount it low on the wall or to the ground. Arrange several bike racks in any way you please, in a row or surrounding a lamp post, to create a picturesque setting - the possibilities are endless. 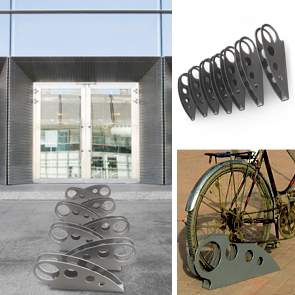 This bike rack is perfect for parks, schools, playgrounds, restaurants, retail stores, and more. Each rack holds one bike and supports the front or rear wheel. 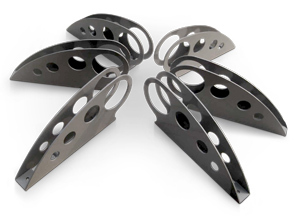 Easy to install with pre-drilled surface mounting holes.